Nkate cake is a delicious sweet that is popular in Equatorial Guinea and in Ghana. 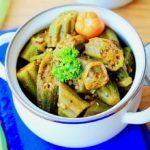 It is also known as kongodo in some regions. 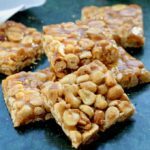 Nkate cake is a crunchy nougat made from roasted peanuts. It comes in the form of small flat squares. 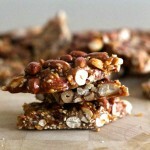 This crunchy snack is addictive, we warned you! Equatorial Guinea is a country located in West Africa. If the country is very rocky and does not allow for extended fields of culture, its coasts and its beaches are exceptional. Food is essentially based on fishing and bushmeat. 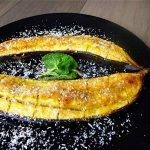 The essential ingredients of Equatorial Guinean cuisine are plantain, sweet potato, breadfruit, yam, cocoyam (locally called malanga), peanuts and snails. There are few treats or desserts in Equatorial Guinea. 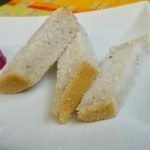 However, kongodo (or nkate cake) is the most popular traditional dessert of the country. 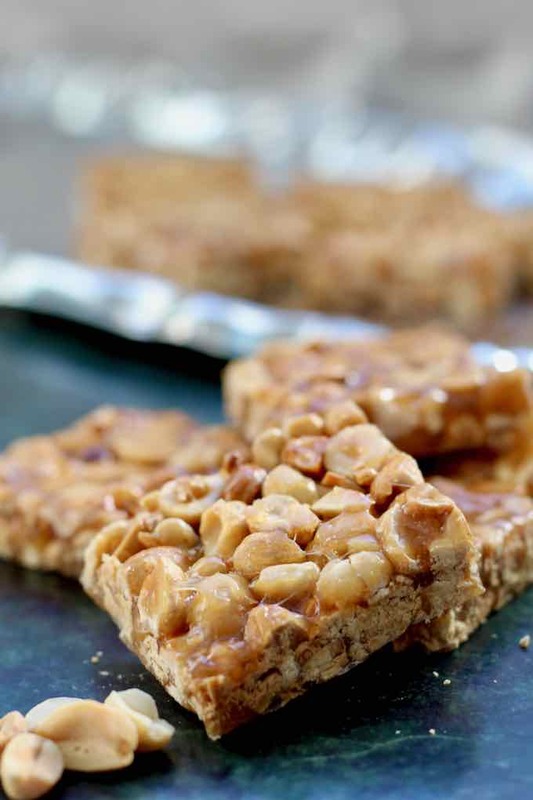 Known as peanut brittle in the United States, nkate cake is relatively fast in execution. 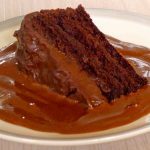 If the recipe only requires a few ingredients, you have to follow a few rules to make a perfect one as cooking caramel is the key to success. It is very important to prepare the nkate cake over low heat to avoid burning the caramel when cooking. 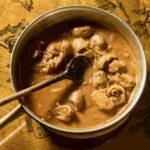 For those who are afraid of getting dirty and find the chores of washing the dishes tedious, there is an excellent trick: just spread the preparation of caramelized peanuts still hot between two sheets of parchment paper before spreading with the rolling pin. Also, do not wait for the complete cooling of the nkate cake to cut it because it will be too late. You may end up with irregular squares and break the other squares by forcing too much on the knife. Remember to keep your nkate cakes in a metal box. If you keep them in a plastic box, they will become moist and sticky and lose all their crispy texture. 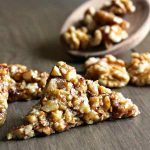 Chikki is an Indian treat that is very similar to nkate cake. 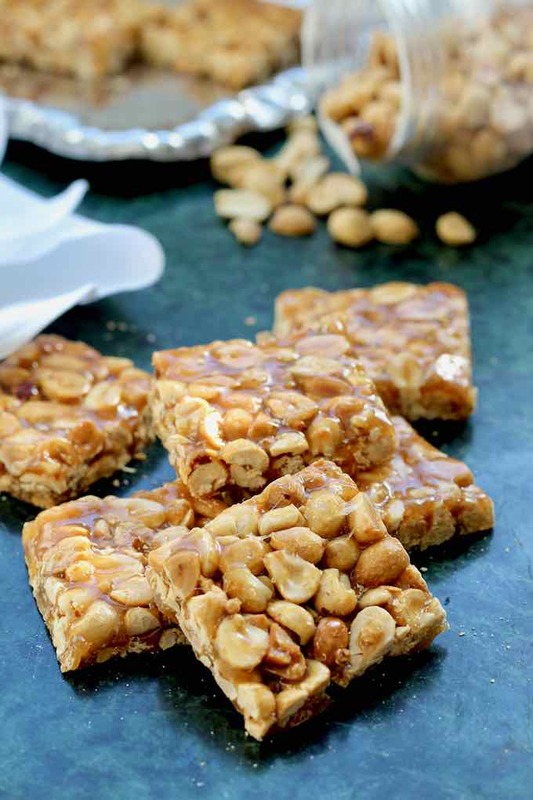 Chikki consists of caramelized sugar and peanuts. This candy is also presented in squares. It takes a different name when the ingredients that compose it differ from the standard peanuts. 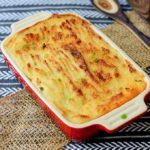 It is also made with white sesame, chickpeas or rice puff. A Creole treat, typical of the island of Reunion, colle pistache (pistachio glue), is identical to nkate cake. This delicacy is composed of peanuts because the word “pistachio” refers to peanuts on the island of Reunion. Chinese nougat is a cousin of nkate cake. Like the sweets of Equatorial Guinea, it contains peanuts. The difference lies in the introduction of white sesame in its composition. Nkate cake is also close to French nougatine (brittle). 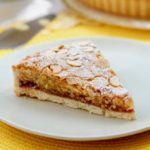 Nougatine consists of almonds, roasted nuts and caramelized sugar. For the record, nougatine was invented in the 1850s by the confectioner Louis-Jules Bourumeau in Nevers (France) and the brand “Nougatine de Nevers” was filed in 1860. The Empress Eugenie is at the origin of the fame of the nougatine, as she discovered it during an official visit in 1862. The nougatine is found everywhere in the world under different names and can be found in the composition of many desserts. The Cypriot pastellaki is a version very similar to nkate cake, with the difference that the recipe also includes sesame seeds. 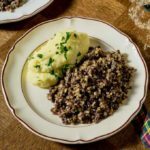 Georgian gozinaki is prepared with walnuts and flax seeds, which are also caramelized with sugar, but honey as well. In Spain, turrón (torró in Catalan) is also close to the nkate cake. It is a Spanish treat that comes in the form of a typical nougat from the Mediterranean basin. But it is the hard version of the turron that is most similar to the West African dessert. It is a crispy nougat that is presented in rectangular bars. It is known as turron de Guirlache. It is not made with peanuts and sugar but contains honey, almonds and sometimes dried fruits. Turrón is enjoyed during Christmas. 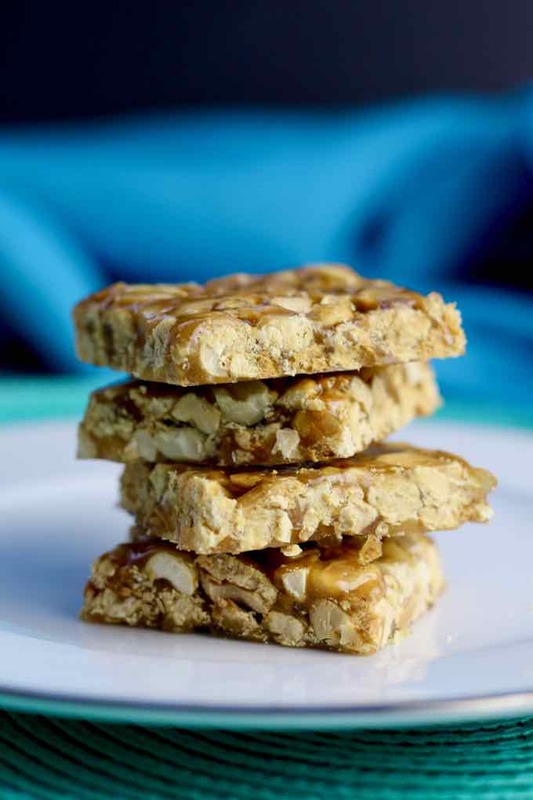 Unlike nougat, turron contains a high percentage of almonds, 60% or more depending on the type. 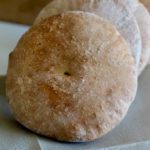 Finally, a street food treat, known as garrapiñada in Spain, is sold at carnivals and at the beach. They are known as chouchous in France. They are sold in sachets or in newspaper cones. They come in the form of caramelized individual peanuts and not in the form of small squares like for nkate cake. All these caramelized nuts are such a treat. Just be careful not to break a tooth! Nkate cake (or kongodo) is a deliciously crunchy brittle made from peanuts, that is popular in Equatorial Guinea and Ghana. Spread the raw peanuts evenly on a baking sheet. Place the baking sheet in the center of the oven and roast the peanuts for 10 minutes, stirring occasionally. Remove the baking sheet from the oven and let the peanuts cool completely. Spread the peanuts on a cutting board and crush them with a rolling pin. Pour the sugar into a non-stick pan and add the water and a few drops of lemon juice. Cook the sugar over medium heat and let it dissolve until it reaches a temperature of 320 F on a candy thermometer. At this point, the sugar syrup should be light in color. Add the crushed peanuts to the sugar syrup. Stir vigorously for 2 to 3 minutes over low heat. 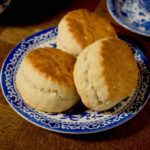 Spread the mixture on a previously oiled cutting board (or between 2 sheets of parchment paper) and use a rolling pin to flatten it to a thickness of about ⅓ inch. Using a large sharp knife, make slight incisions of 2-inch squares very quickly while the mixture is still hot. Operate very quickly before it hardens. Once the nkate has cooled, cut the precut pieces along the cut lines.